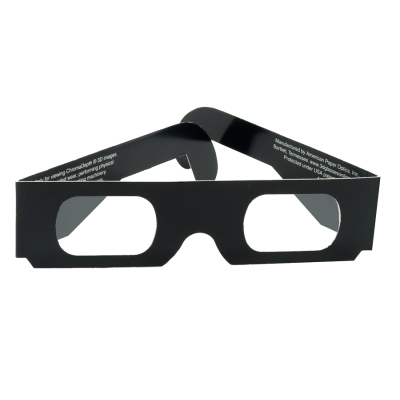 American Paper Optics ChromaDepth® - Shown here are our stock black ChromaDepth® glasses. With ChromaDepth®, this new 3D process allows spectacular 3D images to be created and presented in film, video, television, computer graphics, and laser displays. Unlike the traditional 3D process that requires 2 images , ChromaDepth® information is encoded from a single image through the use of binary optics and color. The 3D ChromaDepth® glasses create striking 3D images from normal 2D images by pulling forward the color red to the foreground and sorting the remaining colors according to their position in the rainbow. The ChromaDepth® process encourages fantastic 3D illusions without compromising the quality of the image when viewed without the glasses. 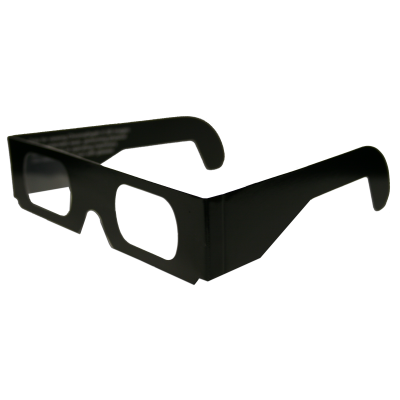 American Paper Optics Chromadepth - Shown here are our stock black ChromaDepth® glasses. With ChromaDepth®, this new 3D process allows spectacular 3D images to be created and presented in film, video, television, computer graphics, and laser displays. Unlike the traditional 3D process that requires 2 images , ChromaDepth® information is encoded from a single image through the use of binary optics and color. The 3D ChromaDepth® glasses create striking 3D images from normal 2D images by pulling forward the color red to the foreground and sorting the remaining colors according to their position in the rainbow. The ChromaDepth® process encourages fantastic 3D illusions without compromising the quality of the image when viewed without the glasses.